Some of the most striking images from the news in the UK this year. 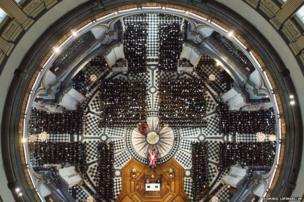 The Queen led mourners in St Paul's Cathedral at the funeral of Baroness Thatcher, Britain's longest serving prime minister of modern times. Four thousand police officers were on duty in central London but, despite concerns about demonstrations, only a small number of protesters voiced their opposition to Lady Thatcher's policies and there were no arrests. As the G8 rolled into Northern Ireland, local councils took to erecting fake shop fronts to hide some of the derelict buildings near the resort where the event was taking place. 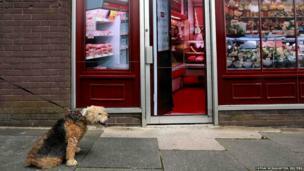 Here a vacant shop in Belcoo is made to look like a working butcher's. 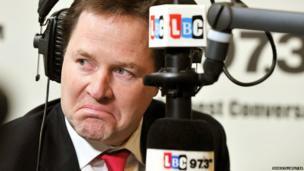 An economic "dawn appears to be breaking", the Deputy Prime Minister Nick Clegg told LBC radio during his weekly phone-in. He echoed other cabinet members as he warned against complacency, but said things were "moving in the right direction" because of the party's decision to go into coalition. 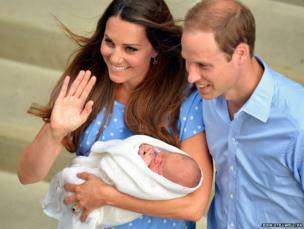 The Duke and Duchess of Cambridge named their newborn son George Alexander Louis. He was born at St Mary's Hospital in London, weighing 8lbs 6oz and is third in line to the throne. 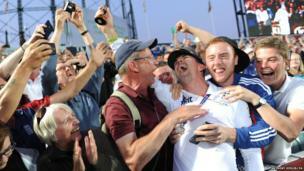 In the summer England's Kevin Pietersen celebrated with cricket fans after winning the Ashes series against Australia for the third time in a row. The following series in Australia at the end of the year did not go so well for England, with Australia winning the series for the first time in seven years. The observation deck on the Shard - western Europe's tallest building - opened to the public in February. 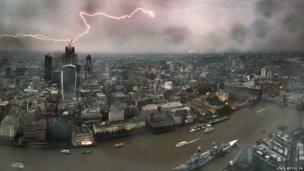 Photographer Lewis Whyld took advantage of the amazing views across London and captured this lightning strike from the deck in July. Vicky Pryce, former wife of ex-cabinet minister Chris Huhne was found guilty of perverting the course of justice by taking speeding points on his behalf. Previously Mr Huhne had stepped down as an MP having admitted the charge, both were sentenced to eight months in prison. 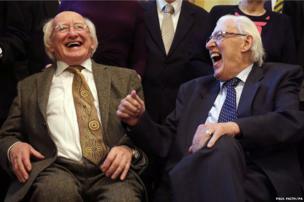 At a reception to mark St Columbanus Day in Belfast City Hall the Irish President Michael D Higgins (left) shared a joke with Ian Paisley, former First Minister of Northern Ireland. An overhaul of GCSEs was announced by Education Secretary Michael Gove (left) to help pupils in England "compete with the best in the world". The government also announced that five-year-olds will start tackling fractions and computer algorithms. 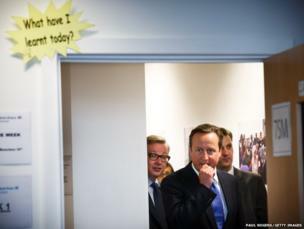 Prime Minister David Cameron said this "revolution in education" was vital for the country's economic prosperity. The Prince of Wales showed off his skills in the kitchen when he attempted to make strawberry tarts during a visit to Reids bakery in Thurso. As you can see, not all went to plan. 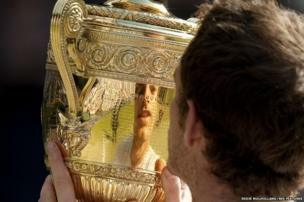 Andy Murray won his first Wimbledon title and ended Britain's 77-year wait for a men's champion by beating world number one Novak Djokovic. In an atmosphere reminiscent of his Olympic final win last summer, Murray was willed on by the majority of the 15,000 spectators on Centre Court, thousands watching on the nearby big screen and millions more around the country. 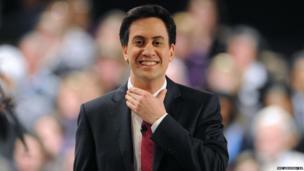 Labour leader Ed Miliband said the next general election would be a choice of "hope over fear", as he promised a "battle of ideas" between his party and the Conservatives. But the Conservatives said the Labour leader was "weak" and had "no plan". The summer was the ninth warmest since records began in 1910 and here a couple take a selfie on the beach at Broadstairs in Kent. Oxford Dictionaries declared the selfie the word of the year, defining it as "a photograph that one has taken of oneself, typically with a smartphone or webcam and uploaded to a social media website". 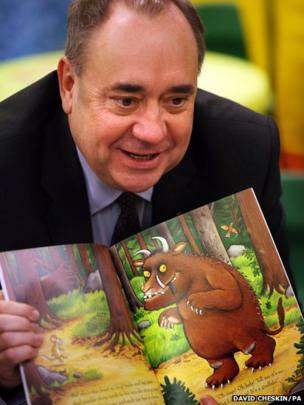 Scotland's First Minister Alex Salmond visited a childcare centre in Edinburgh ahead of a debate at the Scottish Parliament on Scottish Independence. In November his government launched its independence blueprint, calling it a "mission statement" for the future. 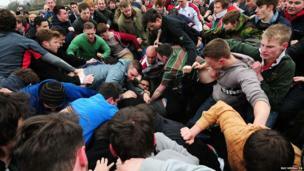 Every Easter Monday the Leicestershire villages of Hallaton and Medbourne take part in a game of bottle kicking, a tradition which dates back more than 1,000 years. 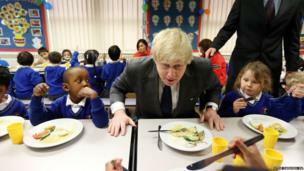 London Mayor Boris Johnson continued to govern the capital while being linked by some with a possible return to Parliament - and even a potential future as Conservative leader and prime minister. 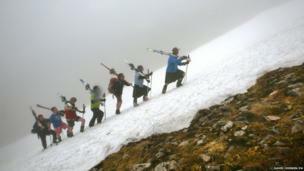 On Midsummer's Day, skiers set off from Aonach Mor on the Nevis Mountain range as thick fog covered the hills of Fort William. Sixty years after enjoying her first Royal Ascot winner as an owner, in the year of her Coronation, the Queen's filly Estimate held on to win the 207th Gold Cup. 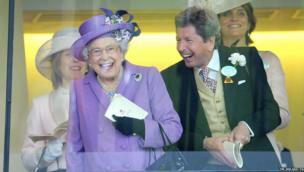 She is seen here celebrating with her racing manager John Warren as the race finished.